The seventh full-length from Death Angel is the purest and thrashiest that they've been in years, which makes life difficult for those of us who quite enjoy the modern, melodic, groovy form of thrash that they and other bands have been putting out in the last few years. From the cover art of The Dream Calls for Blood, which is a colder, icier version of 2010's Relentless Retribution you'd expect a colder, icier album, with less fire and vim. Yet no, quite the opposite, leading you to wonder what passes through band's heads at times when it comes to little touches like joining up artwork and music. Still, if the worse things you can say about a thrash album are 'the artwork is misleading' and 'it's heavier than I was expecting', then you're being a bit nitpicky to say the least, and although The Dream Calls for Blood doesn't reinvent thrash in its own image (and has a silly name – what would have been wrong with 'The Dream' or 'The Call' or 'The Blood'? ), it does show what a solid group Death Angel can be when they get their heads down. Opener Left for Dead toys with an acoustic opening for less than thirty seconds before kicking into the high-octane thrashing, a nicely implemented bit of gang-shouts and a lovely old-school breakdown leading to a vicious thrash beat-down that comes over as Testament's melodic touch joined with Destruction's aggression. It's a balancing act that few thrash bands could have got so perfect – the crunchy riffing of the following Son of the Morning fuses perfectly with the vocal hooks and frequent soloing. Structurally, it's a darn sight more complex than you generally get with thrash, although Death Angel haven't strayed into any prog-thrash hinterlands; it's still very much the sort of aural assault that will go down a storm live. The playing, though, is excellent; Cavestany and Aguilar have a vast amount of riffs at their disposal and make full use of them, while Carroll and Sisson make a solid rhythm section. Osegueda's clean-ish vocals seem to have been reduced since the last album, still popping up on the likes of Fallen but coming far less often than his usual thrash yelp, which is one of my favourite in the genre – perfectly understandable, well enunciated and yet just as vicious as others. And given that the core of the band have been playing together for nearly fifteen years, with Cavestany and Osegueda going back to the eighties, it's really no surprise that the songs here are so professional. There's not really a weak moment, the likes of Caster of Shame powerful thrashers and even the odd groovier mid-paced cut like Detonate having an enjoyable heavy metal vibe that fits alongside the speedier numbers perfectly. Aside from some moments which seem like experimentation was planned but quickly minimised, such as the guitar screeches on the otherwise crushing Succubus, Empty's extended instrumental opening, and the acoustic guitar opening Execution / Don't Save Me, this is Death Angel at the strongest, thrashiest, most metal they've been in years, possibly decades... Possibly the best album they've put out since Ultra-Violence in pure thrash terms, to really go all-out, although I'll have to do a lot of relistening to determine that! Maybe the recent tours where they played that classic in its entirety reawoke something in the band. 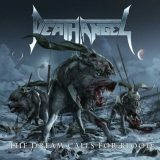 I already know The Dream Calls for Blood will stick around on my playlist for a while, however, as it's a kickass album and just the sort of thing Death Angel needed. A solid album from a band not always known for it.